With World Gold and Silver Coins, Shipwreck Silver and Gold Ingots, Shipwreck Artifacts and even Miscellaneous Coins and Antiques from Colonial Days or Later. 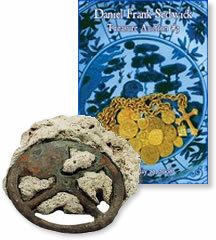 Winter Park, FL — Daniel Frank Sedwick, LLC announces the release of their new mail-bid Treasure Auction #4 by catalog and internet. The auction closes November 6. Numismatist Daniel Frank Sedwick featuring Treasure Auction #3 with over 1100 lots, including a rare astrolabe, gold cobs, silver coins, Chinese porcelains and other artifacts. 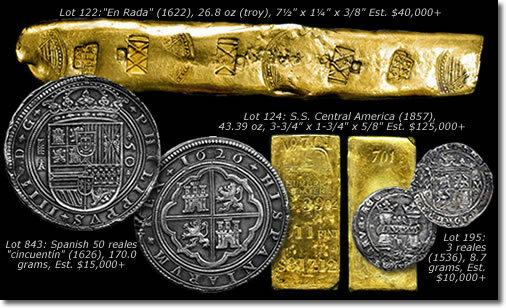 Winter Park, FL – Numismatist Daniel Frank Sedwick is releasing a Treasure Auction, among the items on the numismatic market today are gold cobs, particularly from the Spanish 1715 Fleet off the east coast of Florida, and this sale features dozens of them, all carefully selected for quality and eye-appeal. "We offered the first part of this unique collection of gold pieces in our Treasure Auction #1 a year ago, and they were well received. This time we are certain of the shipwreck name, which should boost their interest even further." Another early important shipwreck find in this auction is the Michael Goldston collection of silver “tumbaga” ingots from a still-unidentified wreck of ca. 1528 off the Bahamas.